Plant pathology is “biology with a purpose”: a highly dynamic science at the interface of microbiology, plant biology, molecular genetics, and production agriculture. The University of Georgia offers one of the best plant pathology graduate programs in the United States with a variety of opportunities for the motivated student interested in areas that range from applied, field-based research to lab-based approaches aimed at understanding pathogens and their interactions with host plants at the molecular level. Plant pathology offers three graduate programs: MS, PhD, and an interdisciplinary, non-thesis Master of Plant Protection and Pest Management degree (MPPPM). The department has a strong tradition in scholarship and an international reputation for cutting-edge research. Graduate students have the opportunity to specialize across the range of disciplines that comprise the contemporary field of plant pathology, including mycology, bacteriology, nematology, virology, genetics, molecular plant-microbe interactions, epidemiology, and integrated disease management. Our faculty work closely with each student to design an individualized program that meets the student’s career goals. The MS and PhD degrees are research-based academic degree programs that demand creative scholarship, technologic skill, and philosophic soundness. These programs emphasize the development of scientists with the ability to fill leadership positions in research, teaching, outreach, and administration. To achieve such goals of excellence, the student must be highly motivated and must make a commitment to the understanding of plant pathology so that biological principles can be developed and applied. Most of our students integrate both fundamental and applied aspects into their research projects and academic programs of study, giving them a truly broad-based experience as well as a competitive edge when entering the job market. The Department of Plant Pathology is a dynamic home of some of the leading scientists in the field. Our faculty members are located in three locations in the state (Athens, Tifton, and Griffin) that are linked to work effectively across distance for instruction and research through interactive video and other technologies. Research resources and infrastructure are shared efficiently for the benefit of the students. Two Plant Disease Clinics provide opportunities to undertake practical training in disease diagnosis and management for the wide range of crops grown in Georgia. 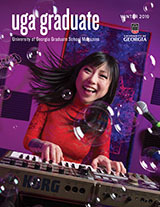 In addition, at the University of Georgia there are strong departments in the allied fundamental and applied sciences in which students can develop their breadth. Prospective students who are interested in financial aid will be considered automatically for any Graduate School, College of Agricultural and Environmental Sciences, or departmental assistantships for which they are eligible.